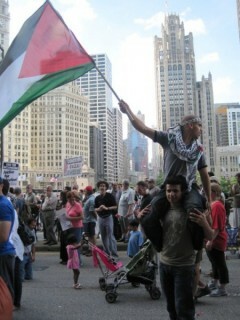 Thousands protest in Chicago against Israeli attack on Gaza Freedom Flotilla | Fight Back! 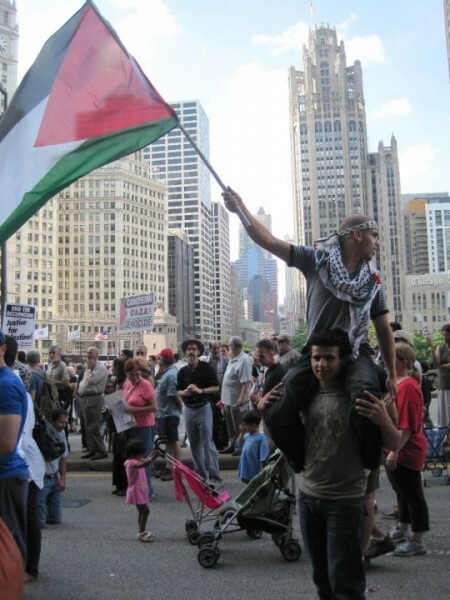 Chicago, IL - More than 3000 people gathered here, June 1, to picket the Israeli consulate in Chicago and to express outrage over the Israeli attack on the Gaza Freedom Flotilla. On May 30, the Israeli army attacked the Flotilla, which was carrying humanitarian supplies to Gaza. The Israeli forces stormed the boat with commandos and helicopters and opened fire on the passengers, while they were traveling in international waters. At least 9 activists were killed and many more were injured. The boats were taken to a port in Israel where all of activists aboard the vessels were arrested and detained. 600 activists, including at least one from Chicago, were arrested. Since then, protests have been held worldwide as people condemn Israel’s attack on the civilian convoy. In Chicago, a diverse crowd, including Arabs, African-Americans and Latinos, picketed in the streets outside the Israeli consulate, chanting, “Free Palestine!” and demanding an end to the siege on Gaza and an end to the Israeli occupation of Palestinian lands. Many also emphasized the importance of boycott, divestment and sanctions against Israel. It is important for us to condemn Israel's actions yet again, said one youth organizer from the Arab-American Action Network. “Boycott efforts are happening all over the world.” In Chicago, the Palestine Solidarity Group has launched a campaign to pressure the city of Chicago to sever its tied with Israel. A demonstration has been called for June 2 to protest Israel’s inclusion in the Sister City program's 50th anniversary banquet dinner. Activists will tell the representatives of more than 70 governments and keynote speaker Mayor Richard Daley that there will be no more business as usual with Petach Tivka. Demonstrators will also demand that Israel free Ameer Makhoul, a Palestinian grassroots activist who was kidnapped from his home last month and tortured at Petach Tikva, where he remains in detention.